Please take bus 1, 6, 10, 17, 19, or 27 to Renji Yiyuan stop and you can see the Qinhuangdao Long-Distance Bus Station immediately after alighting. Get on a coach bound for Yiyuankou there and you will arrive at the destination after around 1.5 hours. 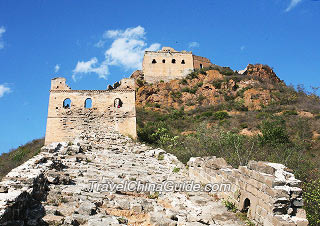 Upon arrival, follow a path by the main road uphill to the Great Wall ramparts. Hike along the remaining stairs for 3~4 kilometers (2~3 miles) and you will reach at the Banchangyu Great Wall Scenic Area. Along the way, you will see over 20 watchtowers and after passing by a tower that was totally laid of stones, the path becomes quite challenging as the Great Wall ramparts stretch through crevices of towering giant stones. Some part is so narrow that only allow one person to go through at a time. After hiking for a few minutes, you will climb up along a stretch of steep ramparts named Sky Stair. Get down from the Sky Stair and you will arrive at a mild section. It is also the lowest point of Banchangyu and you are advised to have some rest there. Continue the hiking tour for a few minutes and you will arrive at the steepest part of Banchangyu with the slope of nearly 80 degrees. The next spot is the Bosom Peaks and there is a watchtower on the eastern peak, named Dajian, with an altitude of 880 meters (2,900 feet). Getting down from Bosom Peaks and heading for a few meters forward, you will arrive at the renovating Yanglai Tower, which is the junction of Banchangyu and Pingdingyu Great Wall. Continue heading along Pingdingyu Great Wall from Yanglai Tower for a few minutes and get down to the Pingdingyu Village. Go across the village to climb up along the ramparts on a mountain to the south. Trek over two hills along the ramparts to the Great Wall Village. Walk through the Great Wall Village and climb up the hill along Chengziyu Great Wall on the opposite side. Hike for around 40 minutes and get down to the Chengziyu Village. Find a hostel in the village to have a big dinner and take a good rest. 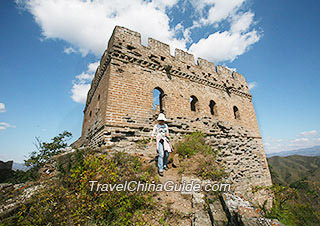 After breakfast, continue your hiking tour along the Great Wall ramparts to the east to reach the Dongjiakou Great Wall. This Great Wall section was originally found during the Northern Qi Dynasty (550 - 577) and was rebuilt in 1571 under the direction of the General Qi Jiguang. Unlike watchtowers of other Great Wall sections, you can find exquisite carvings of plants, flowers, and beasts on the arches of Lijia Tower, Chenjia Tower, and Gengjia Tower, which is rarely seen among all the Great Wall sections in China. After getting down to the Dongjiakou Village, you are highly advised to find a farm house to have a taste of the Whole Roast Lamb. After feasting your stomach with delicious cuisines, please take your return bus to Qinhuangdao and the last bus leaves at 16:00.